WCPE Music Director William Woltz announces a weekend-long extravaganza celebrating Great Classical Music in the cinema, March 18 through 20, 2016. This is one of our most popular theme weekends, and one that will bring back more than a few memories. 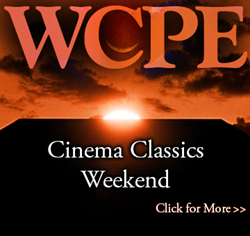 WCPE Music Director William Woltz announces a weekend-long extravaganza celebrating Great Classical Music in the cinema, March 18 through 20, 2016. Throughout this festival, WCPE will share music from films ranging from timeless to obscure. There’s newer music, written especially for the movies, and old masterpieces that make the movie. On Saturday you may request your favorite cinema classic here.